Update: Triangular 5 Dollar Parliament House Coin Released – in May 2013 the Royal Australian Mint released a $5 triangular silver proof coin celebrating the 25th anniversary of the opening of Parliament House. You can read more about it here. In general Australian $5 coins are valued at just that, five dollars. Yes, they are really only worth their five dollar face value. Uncirculated 5 dollar coins such as the 1988 Parliament House issue, the 1990 Simpson and his Donkey $5 or the 1992 Year of Space $5 struggle to even get $5 in the secondary market so it’s often better to just take them to the bank and cash them in for $5. Even coin dealers don’t want to buy them!! 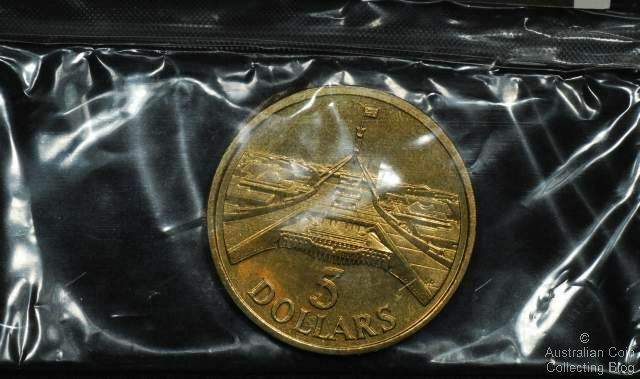 The five dollar coin has never been popular although just over 3 million were issued via the Commonwealth Bank in 1988 where it was quite a novelty to stop in and buy a $5 coin for $5. This was the year Australians were excited over the newest denomination coin, the $2. It was thought a $5 coin for circulation may well have been on the cards. These coins haven’t been a great investment though as today you’re lucky that they are legal tender so you will get your $5 back. Most uncirculated issues have been minted in aluminium, zinc and bronze. The 1994 Vote for Women Centenary, Womens Enfranchisement bi-metal coin has been voted one of the ugliest designs in decimal history. Proof issues (often in silver) have faired a little better and the odd issue a real investment. Silver coins will often trade for their bullion content and not numismatic value. But you never can tell which issue is going to be the money earner and which is the dud, but in the case of 5 dollar coins it’s pretty safe to assume that they’ll prove to be a poor investment.